The Wonder Team tells the story of the most famous and publicized college football team ever to play the game. Few now remember how, in the years after World War I, a small group of talented and colorful young men put Centre College, and the little town of Danville, Kentucky, on the map. 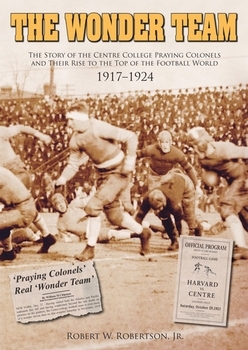 The "Praying Colonels" played all over the country and, despite having only 200 students enrolled at the school, beat all the major powers of the day. Fueled by Robert L. "Chief" Myers' almost supernatural belief that he could attract young players and mold them into a championship team, he and Centre's wonderfully-talented coach "Uncle Charlie" Moran helped the team achieve enormous acclaim not just in Kentucky, but across the entire country. In these years, Centre produced three first-team Walter Camp All-Americans, played in three of the first post-season bowl events ever held, and won the hearts of the entire nation as the Roaring Twenties were ushered in. Their 6-0 win over powerhouse Harvard was the stunning equivalent of a modern-era Ivy League team beating the likes of Ohio State. Dubbed "The Wonder Team" by an adoring press, the team's complete exploits have now been compiled and immortalized by another Centre graduate, Robert W. Robertson, Jr., who has made the telling of this remarkable story a true labor of love.